Mike Adams joined the University of Arkansas as the assistant women’s golf coach in August 2007. Since joining the Razorback program, Adams has assisted Arkansas to the top seven finishes at the SEC Championship, 12 consecutive NCAA Regional appearances and seven NCAA Championship appearances. He became the second Razorback women’s golf assistant to earn NGCA Assistant Coach of the Year when he was honored in 2013. Current head coach Shauna Taylor earned the award in her final season as a Razorback assistant in 2007. Adams began his association with Taylor as her coach throughout her junior years, her collegiate career and while she was on tour as a professional player. 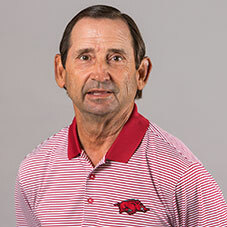 Prior to joining the Razorbacks, Adams worked five years at the International Junior Golf Academy on Hilton Head Island, S.C., where he was a senior instructor. While there, Adams worked with some of the best instructors in the country. In addition, he helped train some of the best junior golfers from all over the world and several of Adams’ former students are currently playing college golf and professional tours. Before working at the golf academy Adams spent 19 years at the Woodlands Country Club in Columbia, S.C. He served the Woodlands as head golf professional, director of golf and for the final three and a half years as general manager. While at the Woodlands, Adams worked with several members of the University of South Carolina women’s golf team who used the Woodlands as their home course. Adams is a member of the Professional Golfers Association of America, an organization he has been associated with for more than 30 years, and he is a member of the PGA’s Quarter Century Club. While in the Carolinas, Adams served on the Carolinas PGA Section Board of Directors and also served on the section’s rules and tournament committee. Adams graduated from Thomas Heyward Academy in Ridgeland South Carolina, and received a bachelor’s of science degree in Business Administration from Newberry College in Newberry South Carolina in 1977. Adams has one son, Michael Adams Junior.